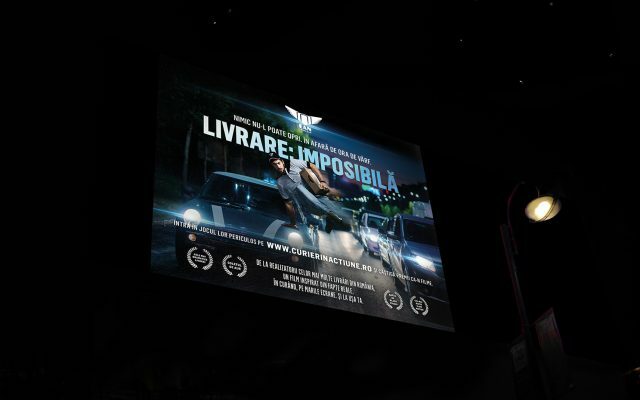 From the creators of the movies Greu de Livrat (Hard to Delivered), Curieri de Sacrificiu (Sacrifice Couriers) and Livrare: Imposibila (Delivery: Impossible), Marks and FAN Courier are presenting another episode in a campaign showing what is means to be a courier. Even the volume of deliveries going up exponentially during discount sales’ periods, the number of the couriers remains the same. The same happens with the roads and the traffic. Moreover, most of the times, the online stores send the packages at the end of the deduction period, not immediately after the order had been placed. During the holidays and celebrations and the promotional campaigns, the e-commerce orders explode and the couriers need to handle the avalanche of parcels and critics. It’s true that not all things go perfectly, but this is what happens when your mission is to be in several places at the same time, like Santa Claus. The agency’s challenge was to show everybody that a delivery is more complicated than it seems at the first glance and to put into perspective the efforts of each courier. The campaign “Curier in Actiune” (Courier in Action) puts in the center of action the main actors of delivering that confront themselves with an impossible mission each time when there are discounts or holidays sales. Because, as difficult as the mission might be, someone needs to accept it. Therefore, Marks’ team decided to do a parody to the action movies in order to show, with humor, that even they confront themselves with an overwhelming task, the couriers don’t give up too easy. It’s a message of recognizing the imperfections, but also a reminder of the fact that only in the movies heroes overpass with good the impossible obstacles. The rest of the normal people can only try. Most of the times the clients aren’t able to see the general image of a delivery. Like, for instance, a blocked road at Bucharest’s exit can delay with a day the deliveries for in Sibiu. We wanted to pre-empt all these discontents regarding the delay through a transparent, open campaign that will present the situation with humor, because it’s enough we stay grumpy at work, in traffic or when we wait for the delivery,” said Roxana Magopet, Marketing & PR Manager FAN Courier. 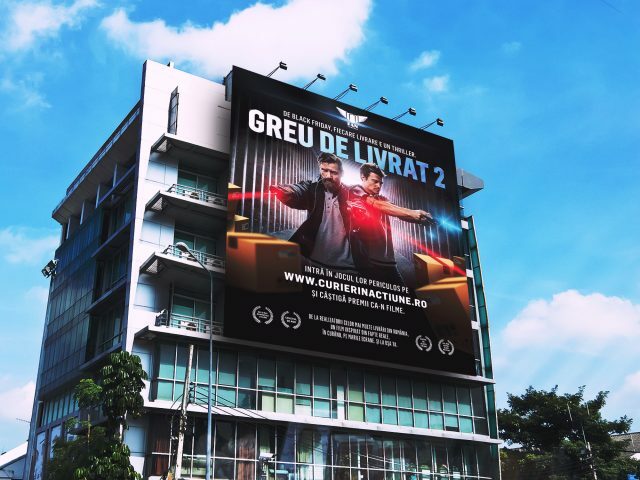 The image campaign is communicated through cinema, OOH, radio, social media and on www.curierinactiune.ro, where anyone can enter in the delivery guy’s skin, for a chance to win the prizes put in the game. The online game action is placed in a world where the discounts invaded the Internet and the fate of the parcels are in the hands of only one man: the courier. 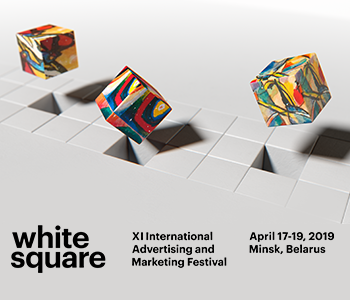 The challenge that the agency is putting out there is simple: take the courier’s place and play (on your own risk), deliver as many packages as possible and win prizes like in the movies, such as cool gadgets and accessories. The city will keep on throwing obstacles your way. The higher your score, the bigger chances of winning. Besides the entertainment value, the idea was to offer the players the chance to understand better what it means to cross the city from one corner to another, against the clock. The number the game was entered, 60.000 in the first month of the campaign, and the number of over 3000 players that played, on average, 45 times, showed FAN Courier and Marks that they succeeded in their goal. The TVCs follow the mishaps of the four couriers through the angle of the cinematographic cliches specific to this type of movie and they are built on the structure of a trailer, with sneak peeks that are awaking the curiosity. Because on Black Friday, every delivery is a thriller,” said Sabina Stănciucu, Copywriter Marks.